Hold your horses, bacon lovers! There's no need to buy a deep freezer and fill it with all the bacon you can get your hands on. Don't worry, no one is coming for your BLT. Even though headlines for the past couple of days screamed, “Bacon shortage!” (including one of our own) and social media blew up with jokes about the impending “porkocalypse,” it's all a lot of oinking over nothing. Let's look at some basic economics. But let's put on our critical reading glasses. The rest of the notice points to declining sow herds in the EU and asks British supermarkets to pay higher prices to pig farmers. It asks for shoppers to only buy British-made pork to protect British farmers, identifiable by the “Red Tractor” symbol on the package as part of a “Save our Bacon” campaign. "British supermarkets know they have to raise the price they pay Britain's pig farmers or risk empty spaces on their shelves next year," said NPA chairman Richard Longthorp in the press release. "But competition is so fierce in the high street at present, each is waiting for the other to move first." Get it? This is an attempt by British pig producers to build grassroots support among British shoppers to apply pressure to supermarkets. Their tool for propping up prices is fear, wrapped in bacon, wrapped in the Union Jack. It's pork propaganda. The release also warned that prices could rise as much as 10 percent. The USDA has forecast only a 2.5-3.5 percent increase. So hold your horses, bacon lovers, there's no need to buy a deep freezer and fill it with all the bacon you can get your hands on. The green number on the LCD screen at checkout might be slightly higher than what you're used to, but there's no bacon crisis. 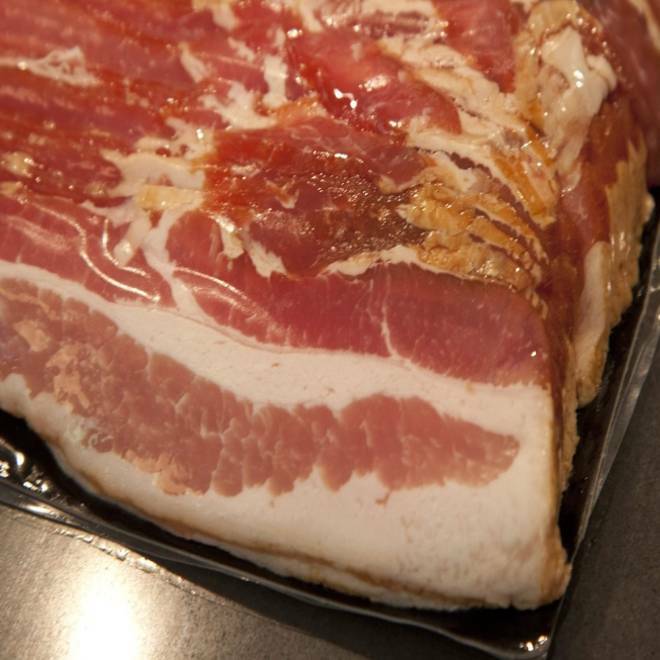 “Bacon prices in the next few months should be quite stable as there is a steady supply of pork going to market and in cold storage,” said Matt Swantek, Swine Field Specialist at Iowa State University. Enjoy all the bacon while you can! Experts are telling consumers to expect rising pork prices, since farmers thinned their herds this year because of the high cost of feed.